Despite a national recession and regional challenges, third quarter results show credit unions with the largest asset bases have used their strength to assist members throughout 2009. 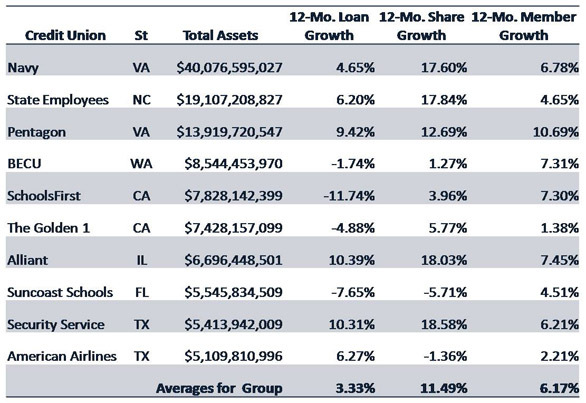 Leaders in loan, share, and member growth all reported double-digit increases from the third quarter of 2008. Despite a national recession and regional challenges, third quarter results show credit unions with the largest asset bases have used their strength to assist members throughout 2009. Leaders in loan, share, and member growth all reported double-digit increases from the third quarter of 2008. Pentagon posted member growth of 10.69%, fueling their 12.69% share growth. Security Service recorded 18.58% share growth and Alliant posted 10.39% loan growth. On a year-to-date basis, first mortgage originations increased 13.9 percent, driven in part by low interest rates and refinances. The same low-interest rate environment driving consumers to refinance has led to increased selling of loans to the secondary market. These credit unions have quintupled sales to the secondary market from the first nine months of 2008. Due partially to the heavy secondary market sales activity, outstanding loan growth has slowed. Total loans outstanding grew 3.3 percent from September of 2008, down from the same group’s annual growth rate of 5.4 percent as of June. Posting 11.5 percent growth since September of 2008, share growth has accelerated since June, when these same credit unions posted an annual growth rate of 9.7 percent. With excess shares and slower loan growth, the largest credit unions have increased their investment portfolios 36.4 percent from September of 2008, underscoring their ample liquidity. With macro-economic indicators mixed on the state of the economy, these credit unions have seen signs of stabilizing asset quality. Delinquency rose 12 basis points from the second quarter to 1.52 percent while annualized net charge-offs remained unchanged from June at 1.46 percent. For more information on the industry’s third quarter performance, click here.